It avoids the number 13, because thirteen is unlucky in the Western world, and it avoids the digit 4, because four is unlucky in parts of Asia. What if this hotel was taller? where the whitespace in each line is a single horizontal tab character. For the input 2, you should print -1 1. This is code-golf. Shortest answer in bytes wins. Gets .first Q-1 numbers that match the filter !=13 and 4 isn't in the string representation of the number. Then it prepends -1 , chops in half, joins each by tabs(C9) and joins by newlines. Saved a whole bunch 'a bytes thanks to usandfriends! Uses the function* for generators. Probably a shorter way to do this, but it was fun. Way fun. I'll bet some golfing can be done. Those weird whitespace things are tabs. It can compute up to 2095984 floors, if each floor is 19.5m high (incl. ceiling) then this building is long enough to be wrapped around the equator! 2095984*19.5=40871688m=~40000km=one 'lap' around the planet. That funny whitespace in there is a literal tab. As Conor O'Brien noted, this is a byte shorter than doing \t. Replace the \t with an actual tab (thanks to Sp3000 for pointing this out, saving a byte). Tests floors c starting from floor -1 until the quota n of floors is reached. 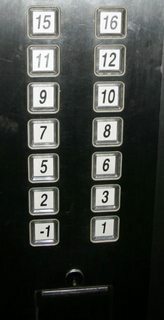 For each floor, tests that it doesn't contain a 4 nor equals 0 or 13. If so, prepends it to the elevator string s and decrements the quota n.
It is unfortunate that the using Linq; is necessary, since it is needed only for .Zip, but writing it as Linq.Enumerable.Zip() is longer. Fairly straight forward, we first assemble a table filled with all the button values. Then we iterate through it backwards, printing two values at a time, or nothing if the second value does not exist. 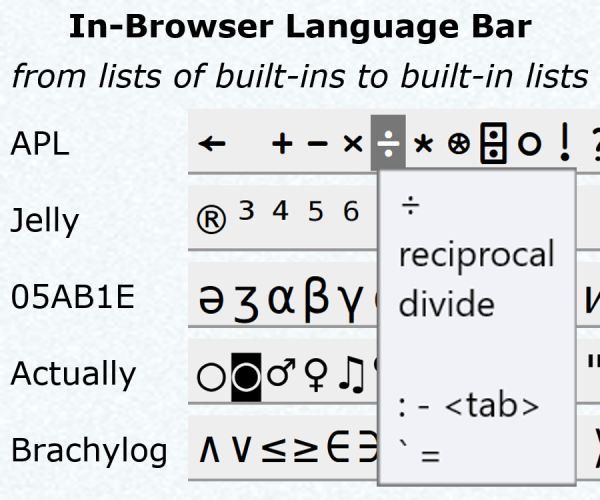 Replace the \t with an actual tab character. Would have been a lot shorter with CLPFD support, here I have to iteratively try integers in the first sub-predicate. The new line before "w,?bb:2&} is mandatory, this is the new line that is printed between every row. I create two lists, and alternate between pushing to them, reverse them, loop through one, and grab the other by index. The four spaces should be an actual tab char. Try it online! JoU*2     // Create the range of integers [-1,U*2). k0 kD     // Remove 0 and 13.
f@!Xs f4} // Filter out the items X where X.toString().match(/4/g) is not null, i.e. the numbers that contain a 4. ¯U ã      // Slice to the first U items, and generate all adjacent pairs of items. f@Yv}     // Filter out the items where the index Y is odd. This discards every other pair. ®q'\t}    // Join each item with tabs. ·         // Join the whole list with newlines. directly do n:find(4) because n is a number. This is a "hack"
nil if X is not found in S.
Slashed off 1 byte, thanks to Conor O'Brien's idea to use literal tab instead of \t. Happy to have all includes in place AND still beat the C solution by 23 24 bytes (also all C# solutions). Both golfed and ungolfed sources are compilable and working. Adds allowed floor numbers to a stack then pops them back off to print them. I played around using an IntStream, but with all the imports this one ended up being smaller. I think listifying, reversing, and self-zipping the floor-number generator s() may have been too clever for its own good, but others have already done the alternative (popping two items at a time), not to mention using Python 2 which saves bytes on some key points. The shorter, but already-done-better alternative takes 140 bytes. Modified version of the python 2 post to fit the python 3 specification. # and matches resulting number to regex. function by2 group a list into sublists of 2 elements. finish with putStrLn to write string on terminal. Assumes an even number of floors, since the problem statement seems to assume it as well and at least one other provided solution breaks for odd numbers of floors. Just add ,:partial as a second argument to rotor, for nine more bytes, to support odd numbers of floors. Did this before I realized edc65 had already made a shorter one. Oh well! Print/Output all positive numbers in which every multi-digit substring in its decimal representation is also prime.